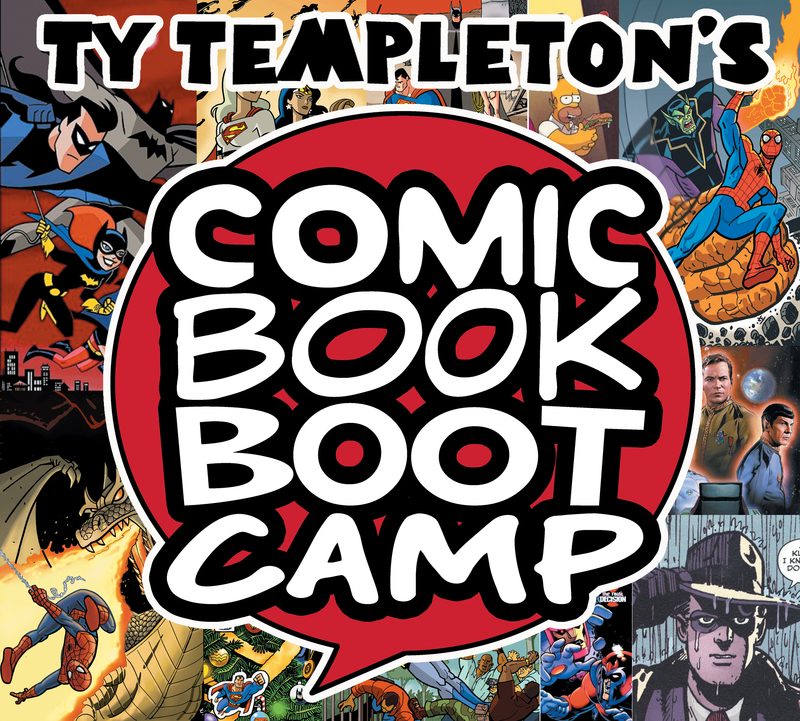 Toronto classes | Ty Templeton's COMIC BOOK BOOTCAMP!! FRIDAY JANUARY 30, 7 – 10pm, COMIC BOOK CREATORS ASSEMBLE!! We had our first Bootcamp get-together a couple of months back and had a loud raucous fun gathering. Bootcamper Shane Kirshenblatt offered up his event space, BACK SPACE TORONTO, for future gatherings (until the end of April, when it closes). As it’s a much larger space, we’ve opened up the gatherings to anyone in the Toronto comics community who would like to join us. Come meet other creators, pro and just-getting-started… network, share stories, check out each other’s work. Ty will be doing portfolio reviews during this event so feel free to bring yours. Reviews will be done publicly for all to see, as watching someone else’s review can be as much of a learning experience as having your own done. I will be hosting a twelve hour comics marathon at the BACK SPACE TORONTO (again, with much thanks to Shane Kirshenblatt for donating use of the space). The event is open to anyone who wishes to participate, but I do need to know how many chairs I’ll need (in case I have to import more) so PLEASE EMAIL ME AND LET ME KNOW IF YOU’D LIKE TO PARTICIPATE! Sorry for shouting, but I wanted to get your attention! Email me, Keiren, at comicbookbootcamp@gmail.com. You can work solo or as part of a team. This is a relaxed easy-going gathering; come hang out, work on a comic… do an analog comic, plan a book, work on a webcomic. Work with whatever media you like; we’ve had people work digitally, with collages (soooooooo cool, Mr. Ricky Lima! ), with ink-stamped letters, and more. Bring whatever materials you’d like to work with. There are some outlets in the room if you have devices which will need charging. If you’re planning to listen to music or shows whilst working, please bring headphones. We will have a SMALL fridge available if you’d like to bring snacks. We’ll have coffee and tea available, and the neighbourhood is full of great restaurants and shops (grocery store only a couple of blocks away, Burrito Boyz just a few doors down!). So, just email me if you’re planning to participate! comicbookbootcamp@gmail.com. And! I’ve just posted the info on March and April’s classes, HOW TO WRITE COMICS PART ONE, and HOW TO DRAW HEADS, HANDS AND FACES. The writing class tends to fill very quickly (and I’ve had people asking about it for months) so let us know if you’d like to be in either or both of ’em. After doing a quick unscientific survey of his Penciling the Page students, Ty has decided to run INKING FOR COMICS in the new year. For new students or those who want to brush up on their comic-making skills, he will also be teaching COMIC BOOK BOOTCAMP PART ONE. Take a quick look at all the information about these two workshops (including, time, dates, location, etc.) and let us know as soon as possible if you would like to join these classes. If you wish to register, or ask any questions, email us at comicbookbootcamp@gmail.com.